We are excited for your family to join our family at Traditions Tree Farm (formerly Westover Farm). Our farm is located in Maple Valley with very easy access from Hwy 18. On a clear day, there is a wonderful view of Mt. Rainier. 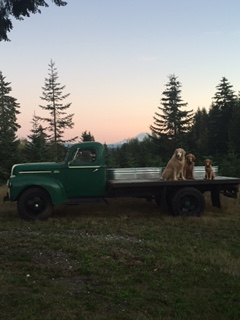 There are many family picture opportunities around our farm including our 1948 Ford flatbed truck. You may choose and cut from our selection of Grand, Noble, and Nordmann Fir trees. For those of you with cathedral ceilings, we have trees available up to 20 feet tall. Twine and netting are available to make your trip home easier. In the gift store, you will find all handmade crafts by local artists. In addition to wreaths and unique Christmas decor, there will be hot drinks and treats available. Payment by cash, check, or debit/credit card. From Hwy 18 East, take the 244th St. exit, turn left on 244th, drive one mile, turn left on 192nd St., second driveway on the right. 24030 SE 192nd St., Maple Valley, 98038. See us on Facebook under Traditions Tree Farm Maple Valley or call 206-604-9233. Time : Open November 23-25, 9 a.m. to 4 p.m.; Friday, November 30 and December 7 noon to 4 p.m.; Saturday and Sunday December 1-2 and 8-9 9 a.m. to 4 p.m.